Everything that you need to know about Meghan Markle’s Wedding Dress. After months of speculation, we finally know what Meghan Markle’s wedding gown looks like. It wasn’t until she stepped out of the car at Windsor Castle that we could see the full look. 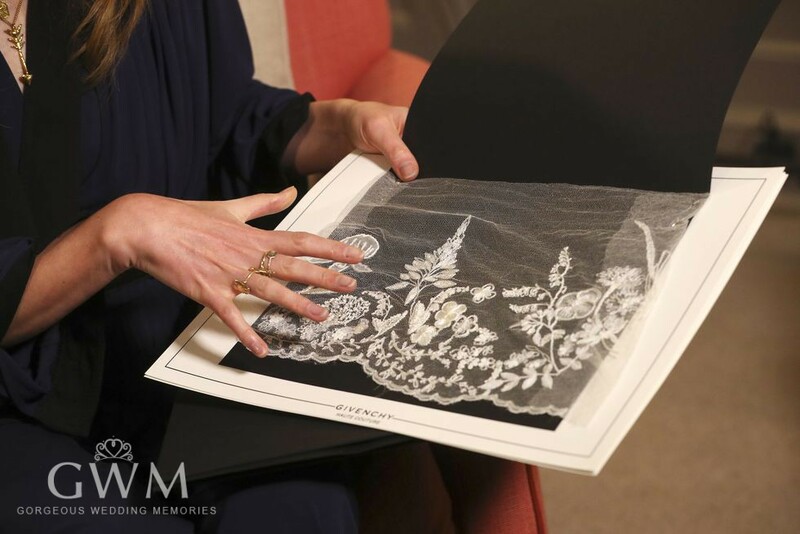 The same day as the wedding, Kensington Palace revealed that Clare Waight Keller Designed the first dress. She has become the first female Artistic Director at the historic French house Givenchy. Clare Waight Keller received the special commission in early January and managed to keep it secret, not only from the inquisitive press, but from her family. 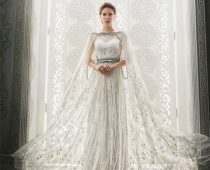 Meghan’s second dress, which was designed by Stella McCartney and featured a high neck, was much less traditional than her formal wedding gown. Her first dress had only six seams. The choice of the historic French fashion house clearly reflected her own simple yet chic style. “The dress epitomizes a timeless minimal elegance referencing the codes of the iconic House of Givenchy and showcasing the expert craftsmanship of its world-renowned Parisian couture atelier,” the palace revealed in statement. The actress was a muse for Givenchy, and often wore similar cuts to Meghan’s first dress. The shoulder-framing bateau neckline and sculpted waist seen on Markle’s dress could have easily appeared on the movie stare decades ago. Waight Keller and Markle picked a pure white double bonded silk cady to bring a “fresh modernity” to her look. “Perfect for the round sculptural look required, the silk cady has a soft matt lustre,” the palace revealed. 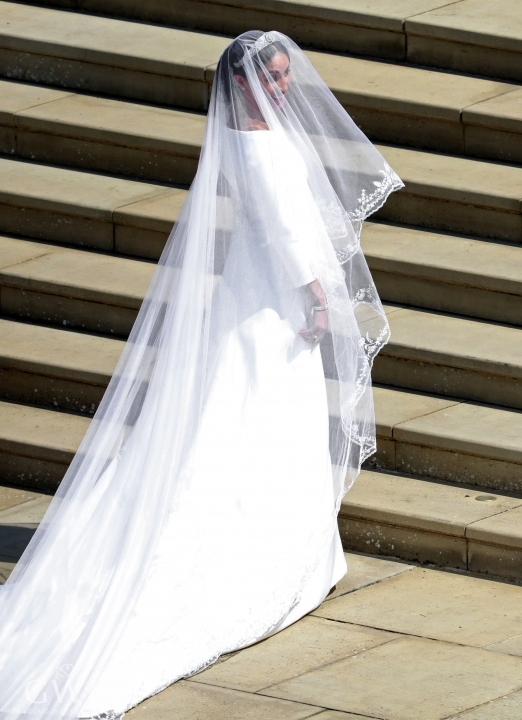 While the dress remained plain, the 16-foot-long veil did not. Markle requested that her wedding look represent all 53 Commonwealth countries, and the elaborate embroidery on her headpiece did the trick. Following significant research, the design team picked a distinctive flower for each nation. Then the textile artists spent hundreds of hours meticulously sewing them in three dimensions onto the tulle. 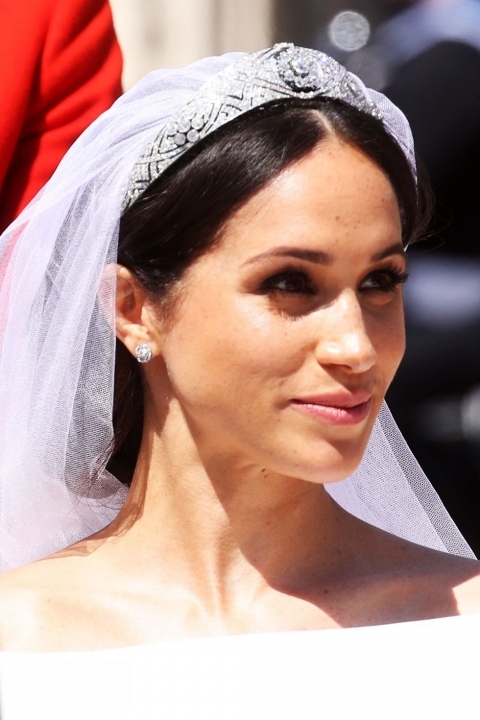 The tiara that Markle wore is Queen Mary’s bandeau that features a detachable brooch of 10 brilliant diamonds in the center. The circa – 1893 Meghan wore actually only became an element of the tiara with the creation of the frame in 1932. The piece hadn’t appeared in public for decades, but Markle had worn her Cartier earrings at least three times before the wedding, meaning she’ll probably bring them out again in the future. We are giving you 25% Off all new orders and the Sample Sale is still on util the 31st of May.